Step 1 Steam the potatoes over rapidly boiling water in a tightly covered pan just until tender, about 15 minutes. Remove from the heat and set aside. Step 2 Combine the artichokes, 3 tablespoons of the olive oil, the water, 1/2 teaspoon of salt, garlic, red pepper flakes, thyme and rosemary in a large skillet. Cover tightly and place over high heat. 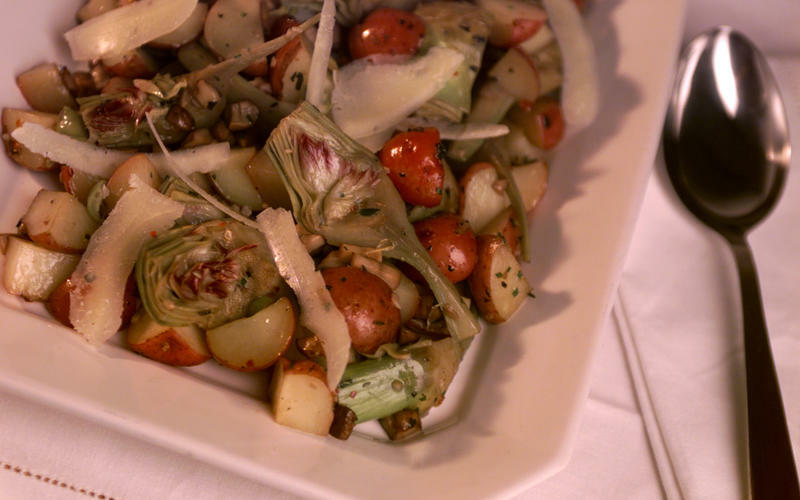 Cook until the artichokes are just tender, 5 to 7 minutes. Remove the lid and continue cooking over high heat until all the liquid has evaporated and the artichokes begin to make a sizzling sound from frying in the oil. Stir frequently to keep the artichokes from sticking. Add the potatoes and reduce the heat to low. In Recipes-list.com we have selected the most viewed recipes from category - Best recipes Main courses Vegetarian . Enjoy the best recipes specially selected for you! Artichoke stew with pecorino Romano is the right choice that will satisfy all your claims.